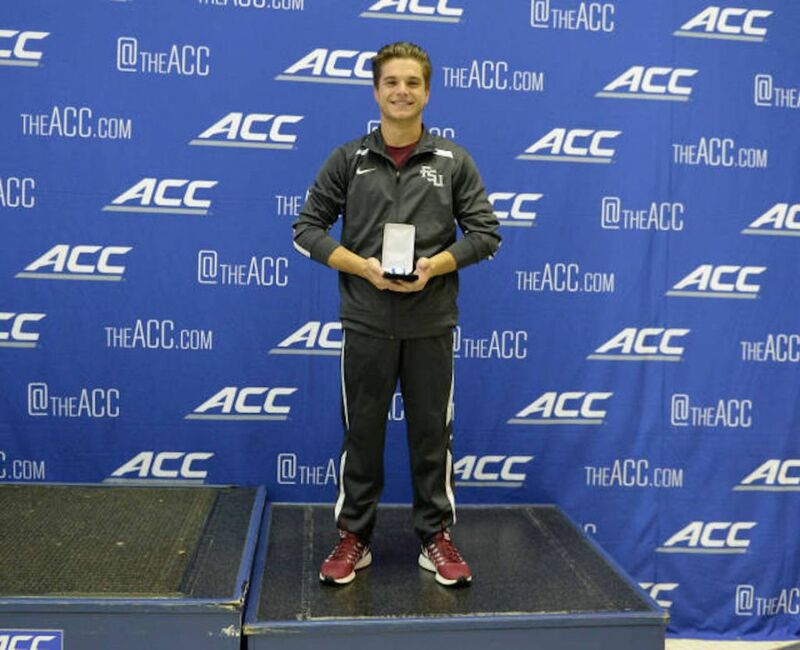 ATLANTA, Ga. – Florida State freshman Molly Carlson was awarded the 2017 ACC Diver of the Meet as the Atlantic Coast Conference Championships came to a close on Thursday night at the McAuley Aquatics Center. Carlson added a gold medal-winning performance on platform in thrilling fashion, scoring 284.05 in Thursday night’s final, after she won bronze on 1-meter (307.65) on Tuesday and placed fourth on 3-meter (335.10) Monday. The Toronto, Ont. native becomes the first Seminole in history to capture MVP honors since platform was added to the meet in 2008. Prior to the addition, Erin Gillooly (1995), Chelsie Lerew (2001-03) and Courtney McClow (2004) took home the award based on their performance in springboard events. In addition to Carlson winning gold, senior Dylan Grisell earned silver in his fourth and final ACC Championship platform final, scoring a total of 391.95. Carlson started the night in sixth place after scoring totals of 55, 44.55 and 50.75 on her first three dives, finding herself in sixth place. In round four, Carlson made her move after several divers missed as she posted 62.35 on her back 2 ½ somersault, jumping up into the lead. North Carolina’s Elissa Dawson would take over at the top after she put down a 73.50 point scoring dive, putting the pressure on Carlson. Carlson saved her best dive for last, a reverse 2 ½ somersault tuck, scoring 71.40 retaking the lead. After Carlson, Frieda Lim of Clemson also put her best dive last, tallying 70.40, but her overall score of 276.25 was not enough to pass Carlson. In his final event of his ACC career, Grisell had to come back from an eighth place start following his first dive, which was good for 51 points. The Toronto, Ont. native made a big move on his second and third dives, moving into medal contention with a 73.95 total on his reverse 2 ½ somersault and following that with a 71.40 inward 2 ½ pike. Grisell held his place through his 64.40 point armstand, however he faltered slightly on his back 3 ½ somersault tuck, scoring a tally of 54.45. Holding in third, Grisell also saved his best dive for last posting his highest total of 76.80 on his back 2 ½ somersault 1 ½ twisting pike. Grisell’s final dive was high enough to hold off two contenders for the silver medal. Joining Grisell in his first ACC Championship final was freshman Aidan Faminoff, who qualified for the round in eighth place with a prelim score of 325.20. Faminoff showed improvement in finals, hitting five of his six dives, including a 72 point forward 3 ½ somersault pike in the fifth round. The Victoria, B.C. native closed out his finals with an inward 3 ½ somersault pike for 57.50, placing him sixth. In the pool, junior Christina Loh made her A final debut, after qualifying for the top heat with a time of 2:11.55 in seventh place. She moved up to fifth at night, clocking 2:13.00. Sophomore Meg Brown led off the swimming portion of the night with a 24th place finish in the 200 back with a time of 1:59.85 after posting a 1:58.52 in the morning swim. Senior Lydia Ware followed Brown in the C final of the 100 free, placing 19th tying her personal best at 49.38 in both finals and prelims. In addition to Loh, sophomore Natalie Purnell moved up in the B final, placing 14th with a personal best mark of 2:13.00 while senior Caroline Neil closed out her career with a 18th place finish, touching with a time of 2:13.86, which was her best time. Both Purnell and Neil earn a spot on FSU’s all-time top 10 list in fifth and seventh respectively. Swimming in the final individual event of the meet, junior Tayla Lovemore made a surge in the back half of the 200 fly, touching in second in the C final with a career best time of 1:58.53, which ranks fifth in school history. The Seminoles closed out the night with a seventh place finish in the 400 free relay behind Ware, sophomore Michelle Turek, freshman Nika Blank and Lovemore, with a time of 3:17.35. Ware led off with a personal best of 49.37, while Blank (49.05) and Lovemore (48.81) anchored with their best splits. Florida State finished the meet in eighth place with a total of 625.5 and freshman Ayla Bonniwell, Carlson and Grisell all took home All-ACC honors. Members of the men’s and women’s teams will be competing next weekend at the Bulldog Last Chance Invite, in Athens, Ga. next weekend. For more information, visit Facebook, Twitter and Instagram.